The new Monster Wheels slot is here and to celebrate we have a great Microgaming no deposit bonus for all our readers. 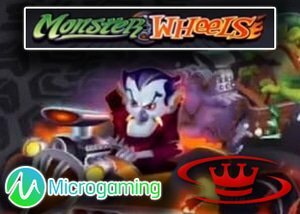 The new Monster Wheels slot from Microgaming is a 5 reel video slot available to play on desktop, tablet, and other mobile devices with no download required. Spins start from as little as 0.20 going up to 15 depending on the number of paylines you play. As you probably guessed from the title, the theme is about a car race and features animated monsters. The background is a display of tires on fire and the reels themselves resemble the engine of a car. Players get to choose from two different reel sets which means you can play a 128 payline reel set or a 288 payline game. You can also chance the reels at any time during the game for even more wins. The high paying symbols all come with monsters on the cars. These include a werewolf, a devil girl, Frankenstein, a mummy, Dracula, and a zombie. There are playing card symbols too. The scatter symbol is a gasoline tank featuring the word scatter and there is also a wild symbol which is the game's logo. The free spins round can be re-triggered as well and if you land a scatter symbol on the reels during any of your free spins you will get an additional free spin too. Get 2 scatters and you get two more free spins. The multipliers in the new Monster Wheels slot are amazing and you can get up to 7500x your wager if you win during the free spins feature. This slot releases to all Microgaming casinos on the 21st of September and to celebrate you can get a great Microgaming no deposit bonus from Casino 440, and we have all the details below. The Casino440 bonus for all Canadian players is a $5 no deposit bonus. This is a great way to test out the games this online casino has on offer as well as trying out the new Monster Wheels slot. All you need to do is use the bonus code 5FREE in the cashier section when you register as a new player. There are wagering requirements and terms and conditions, and you can win real money too. After you've used your no deposit bonus, you can make your first deposit and claim the Casino440 welcome bonus which is 200% up to $150. That's not all, this online gambling site offers a monthly bonus for returning customers which is 100% up to $150 and 250 free spins. The promo code for this offer is RELOAD and once again there will be wagering requirements and terms and conditions to adhere to. The promotions don't end here. Every day there is a draw for $10 in free casino cash and to in with the chance of winning all you have to do is use the promo code 10PRIZE. You can find all the information as well as the full list of promotions on the casino website. Casino440 is one of the top no download casinos and one that we recommend for all Canadian players.